Here are some situations I can think of. * Use CR – when you found team member is motivated with some kind of reward & you can arrive a mutual agreement with your team member on reward he is getting after the work done is expected fashion. * Use MBE-A – when you don’t want a mistake/error done by your team member propagates further that may jeopardize the project. You actively get the statuses, problems, challenges, develop processes, ensure adherence of project processes, conduct reviews, etc so that no error goes beyond certain time period. This really required when you manages a critical project & have time to do micro management. This is used when team member is having less experience in the work area. MBE-A may be required and effective in some situations, such as when safety is paramount in importance. * Use MBE-P – when you don’t really care much about the errors or deviance as soon as it occurred. You have some time to correct them & they are not critical. This is followed when team member is having good experience in the area of working. 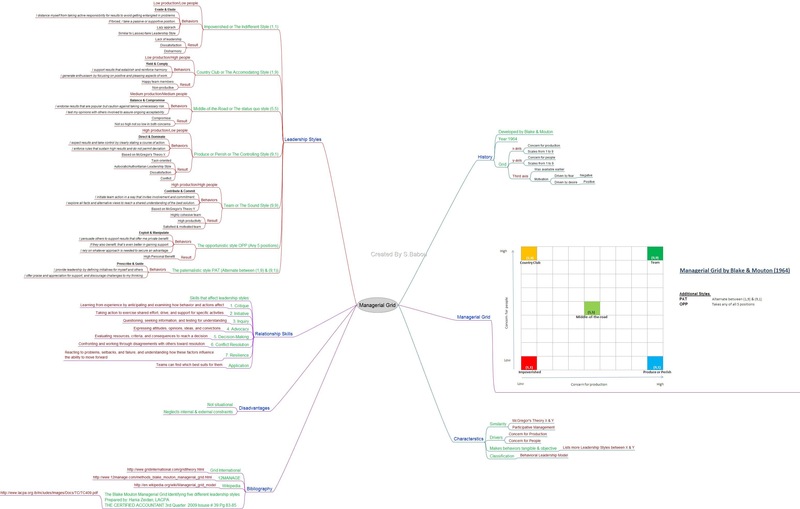 Here is my first article on Leadership Theories in a Mind Mapped form. This article explains about Managerial Grid Leadership Model. I attached the document in pdf format for download. 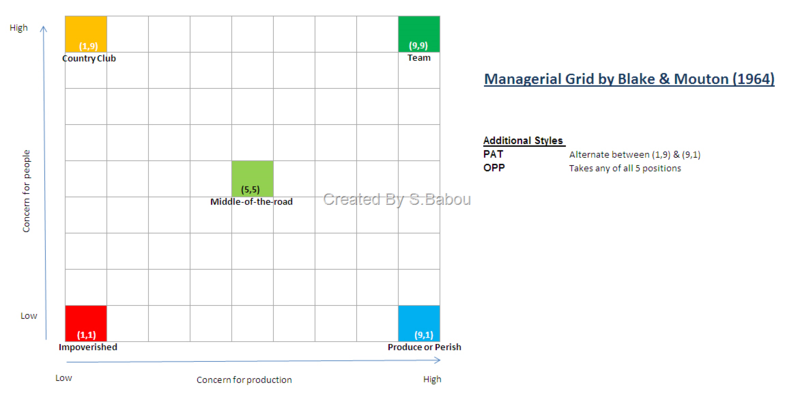 Picture in PDF file here Managerial Grid. I distance myself from taking active responsibility for results to avoid getting entangled in problems. If forced, I take a passive or supportive position. I support results that establish and reinforce harmony. I generate enthusiasm by focusing on positive and pleasing aspects of work. I endorse results that are popular but caution against taking unnecessary risk. I test my opinions with others involved to assure ongoing acceptability. I expect results and take control by clearly stating a course of action. I initiate team action in a way that invites involvement and commitment. I explore all facts and alternative views to reach a shared understanding of the best solution. I persuade others to support results that offer me private benefit. If they also benefit, that’s even better in gaining support. I rely on whatever approach is needed to secure an advantage. I provide leadership by defining initiatives for myself and others. I offer praise and appreciation for support, and discourage challenges to my thinking. Leadership does not end with the person who shows the characteristics. Leadership is a journey; Journey is moving from one point to another – Leadership is moving from one level to another; even if you return to the same point you will have a different level of thinking and understanding. Leadership needs followers, it requires dedication and one needs to follow its principles throughout his/her life. This might be the reason why it is a bit complex to understand Leadership as a whole. We already briefed about Transformational Leadership in earlier post, now it is required to know the constituents of it to practice it well. Transformational Leadership has a long history and it evolved after earlier theories on behavioral, trait, charismatic & situational leadership models. So, it has overlapping with those other theories. Especially, Charisma is one of the components of Transformational Leadership. You will understand more about Influence when you read Dale Carnegie’s “How to Win Friends and Influence People”. John P. Kotter dealt in detail on this topic in his book “Power and Influence”. No matter whoever it is, as a Transformational Leader, you have the capability to become the role model for them. You are respected & admired by your followers. They have a separate place for you in their heart. You have absolute trust on your followers and they also have it for you. Your followers understand that you have great potential and determination which will take them to higher levels. You are having the willingness to take risks and be consistent. In any situation, you show high standards of conduct. One or the other way, Inspiration and Motivation are always part of leadership. We know about Inspiration and motivation separately and they are used interchangeably. Let us see their connection in the below highlighted text before we get into Inspirational Motivation. Motivation really comes down to inspiration. Since motivation comes from within, it is a form of self-inspiration. This process is nurtured by watching others achieve their goals. Most often it is developed by following the example of leaders who do the right thing for people, communicate frequently, empower vigorously, coach regularly, and sacrifice for others. As a Transformational Leader, you have a vision. You communicate expectations with followers and show optimism in reaching the goal. By your vision, activities and behavior, your followers get motivated and inspired. They all feel team spirit and work enthusiastic as a group. They start demonstrating their commitments towards the goal. Motivation can occur only if two-way communications happen. This component deals with stimulating followers’ analytical skills and problem solving ability. Everyone has the skill to analyze problems in their hand. Each one has a different approach to an issue. As a Transformational Leader, you need to allow followers’ to come up with their solution (it may be different from yours) for the same problem. If the issue is not understandable you can help them to re-frame it. Encourage them to approach old issues with new methods to come up with meaningful output. Encourage their creativity and innovation. Don’t criticize or don’t pass sarcastic comments in public. Each individual is different. Followers’ have different needs & show different levels of potential. As a Transformational Leader, you need to accept this. You need to develop higher levels of potential. It cannot be achieved by showing the same level of attention. You should take special care of each individual follower’s need for achievement and growth. Provide supportive environment. Have clear two-way communication in understanding their concerns. Develop your follower by delegating tasks. Monitor and provide improvement tips on delegated activities and make them produce finer output. This increases followers’ confidence and morale. Following is a Q & A from “The Mission Statement That Changed The World”, posted on March 3rd, 2008 in Steven Covey’s Blog (Link). You can match each of the transformational components with Gandhi’s mission statement listed below. Q: Who is one of your personal heroes? * I shall not fear anyone on Earth. * I shall fear only God. * I shall not bear ill will toward anyone. * I shall not submit to injustice from anyone. 2. Is anything called transactional leadership exists? Number of Leadership theories evolved on the basis of Trait, Behavioral, Transformational, Situational, Charisma. Researchers and thinkers made efforts linking some of the theories across these leadership islands. But each model has its own pros, cons, assumptions & limitations. Latest researches are conducted on Situational & Transformational leadership styles. Leadership gurus presented new models as variations to the already existing models. Max Weber, MacGregor Burns, Bernard M.Bass, Warren Bennis & Nanus are few important researchers in the area of transformational leadership. Understanding the difference between transactional and transformational leadership is vital in getting the whole concept of transformational leadership theory. As a starting point, let us review our everyday life. In general, a relationship between two people is based on the level of exchange they have. Exchange need not be money or material; it can be anything. The more exchange they have the more stronger the relation. Your manager expects more productivity from you in order to give good rewards. In this way, if something is done to anyone based on the return then that relation is called as ‘Transactional’ type. In politics, leaders announces benefits in their agenda in exchange to the vote from the citizens. In business, leaders announces rewards in turn to the productivity. These relation is all about requirements, conditions and rewards (or punishment). Leaders who show these kind of relationship are called ‘Transactional Leaders’. In life, at one point of time, things happen without expectation from other side. Say, mom’s dedicated service to her kid. Mom doesn’t expect anything from the child and the service she provides in raising the child is unconditional, dedicated, committed. Mom plays a major role in shaping up the kid’s future life. This type of relation is called as ‘Transformational’. Leaders do exist in this world with these behaviors. Transformational Leaders work toward a common goal with followers; put followers in front and develop them; take followers’ to next level; inspire followers to transcend their own self-interests in achieving superior results. As exactly said by Bass – “the transactional leaders work within the organizational culture as it exists; the transformational leader changes the organizational culture”. Following table shows difference of transactional and transformation leadership. * Leaders motivate followers to work for goals that go beyond self-interest. Initial studies portrayed Transactional Leadership and Transformational Leadership as mutually exclusive, but Bass viewed the transactional & transformational leadership as continuum rather than opposites. The transformational leadership style is complementary to the transactional style and likely to be ineffective in the total absence of a transactional relationship between leaders and subordinates. 1. Comparison studies of different transformational authors – Bass, Cacioppe, Gronn, Hughes.et.al, Popper & Zakkai by Vanisha Balgobind in “The impact of Transformational Leadership on Subordinate Job satisfaction” dissertation work – June 2002. 2. Transformational Leadership by Colonel Mark A. Homrig, 21 Dec 2001. Retrieved from http://leadership.au.af.mil/documents/homrig.htm as on Aug 1st 2008. 3.Transformational Leadership: Characteristics and Criticisms by Iain Hay. Retrieved from http://www.leadingtoday.org/weleadinlearning/transformationalleadership.htm as on 1st Apr 2012. 4. Bass (1990a); Cox (2001); Epitropaki; Hall, Johnson, Wysocki & Kepner (2002); Lussier & Achua (2004); Stone, Russell & Patterson (2003); Tichy & Devanna (1986); and University of Regina. 1. Is anything called transactional leadership exists? 2. What are the components of Transformational Leadership? Delegating is like a magic wand in the hands of smart managers. Delegating is highly effective when used properly but it is a complex one to practice. Whatever be the leadership model, ‘Delegating’ is an undisputed leadership style discussed across all those models. “Effective delegation takes emotional courage as we allow, to one degree or another, others to make mistakes on our time, money and good name. Let us review simple definition of Delegating: Delegating is assigning a task that you currently have in your activity list(for which you are ultimately responsible) and assigning it to other person with confidence that he will complete with minimal or no involvement from you. As far as managers are concerned, Delegating allows them to make the best use of their time and skills, and it helps team member’s growth and develops to reach their full potential in the organization. Why Delegating is not performed often? Here are the few reasons managers tell for not delegating a task. Reviewing these would be a good learning on common mistakes which we do. * If delegating is done well, a project manager can quickly build a strong and successful team of people, well able to meet the demands that others place. What are the parameters to do delegating? When delegating few things to be kept in mind. * Avoid upward delegation – that is, avoid having your team member turn to you to solve every problem that they encounter while performing the tasks that you delegated to them. * Always have progress check points – Delegating is not just giving the work to someone and leaves it. This helps to find out whether the work progress in the right direction & gives more confidence on the timely delivery. * Don’t delegate if you don’t know about the task – if you don’t know what to do to complete the task then we cannot get it done from others. * Don’t delegate task that requires confidentiality or sensitive issues – there are few tasks like performance appraisal, interpersonal conflicts, sensitive matters (particularly lay-off) should not be delegated. They are exclusive duties of managers. 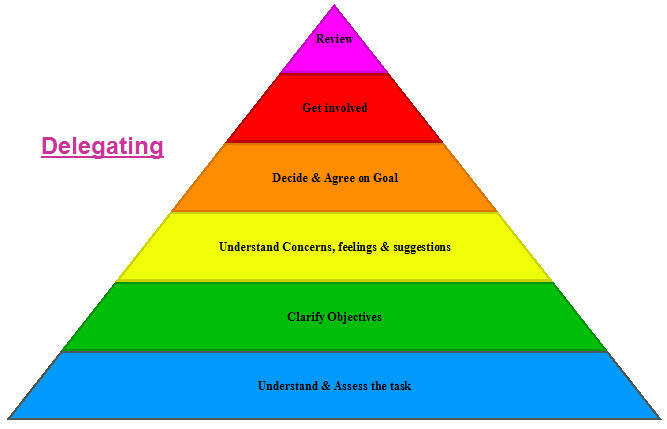 Basic step of delegation is understanding & assessing the task you want to delegate. Assessment should be based on delegation parameters – complexity, level of skill, level of commitment, need for involvement. Without proper understanding one cannot delete a task to others. After identifying the resource to do the work, next step is clarifying the objectives to him. Mainly, explain Why -> The purpose, What -> the goal and How -> the boundaries of the task, so the person has a clear picture of what we are wanting to accomplish. Also, talk on the reward, recognition & learning new skills. Also, understand & deal the comfortableness, concerns, feelings & suggestions of the member. Member should feel responsibility & not that he gets only extra work to perform. Based on outcome of this step, you may need to select different resource if there is any conflict of interest. Next step is agreeing on time line, quality standards, level of your intervention, authority and accountability. This step is vital as this would be the baseline for further verification of work. Delegate the task and not the method to accomplish it. Let your team member will decide that. This makes the member to take personal initiative which gives him sense of contribution. It is important to express confidence on member’s work, your availability for support, and your appreciation during progress. Another important step is staying involved at the level agreed. Maintain open lines of communication. Checking too often or not getting involved will create negative impact. Revisit the frequency of communication based on the situation and negotiate. Review the work done (not the method) in the agreed time interval and give positive and corrective feedbacks. If you’re not satisfied with the progress, don’t immediately take the project back. Continue to work with the member and ensure they perceive the project as their responsibility. After the final result delivery, take necessary initiative to fulfill the agreed reward.